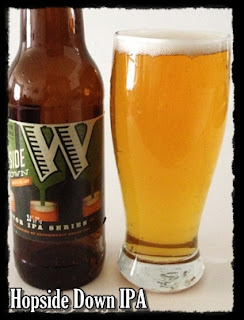 The Genuine Beer Blog: Widmer Brothers Brewing Company - Hopside Down IPA !!! 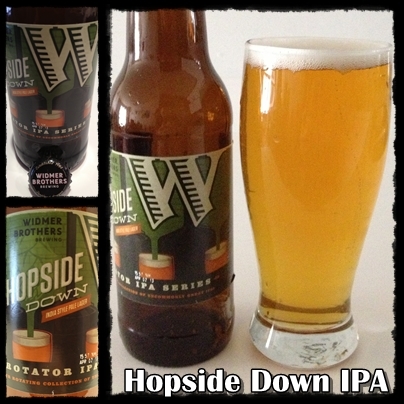 Widmer Brothers Brewing Company - Hopside Down IPA !!! Sorry it's been a while things have been crazy busy recently; but we're back. Widmer Brothers Brewing Company's Hopside Down IPA is a light, crisp beer with the characteristics that you would expect from a lager/pilsner style of beer, however it packs the deep, full flavours of a great IPA. Hopside Down IPA is light in colour with a deep, rich hops flavour that you would come to expect from a traditional IPA. There is a real hard hitting punch of hops that I love in a beer and is something that I would certainly be looking for in an IPA. There is a slight bitterness to this beer with a mild citrus note, this gives the beer a real moreish quality; making you want to go back for more and more. The overall feel of the beer is a smooth, light, well rounded beer; balanced with the strong hops flavour, giving the bitter notes, but with a slight sweet edge to give an overall well balanced beer. Hopside Down IPA also backs a punch when it comes to Alcohol Percentage, coming in at 6.7% ABV. This however isn't a problem for this beer as it doesn't feel like you are drinking a beer that is that strong in alcohol, which is a great attribute. Overall Hopside Down IPA is a really well balanced IPA with bitter notes and a strong, developed hops flavour. This beer will not leave you disappointed and I recommend going out and getting yourself a bottle as it is a truly fantastic beer. All in all I think that Hopside Down IPA is a must buy beer and one you can enjoy anytime.